I read Geek Love by Catherine Dunn when I was in my mid-20s — a novel rich with wicked and sympathetic details about a family of carnival geeks and the social pecking order of people who market physical differences or deformities as entertainment. 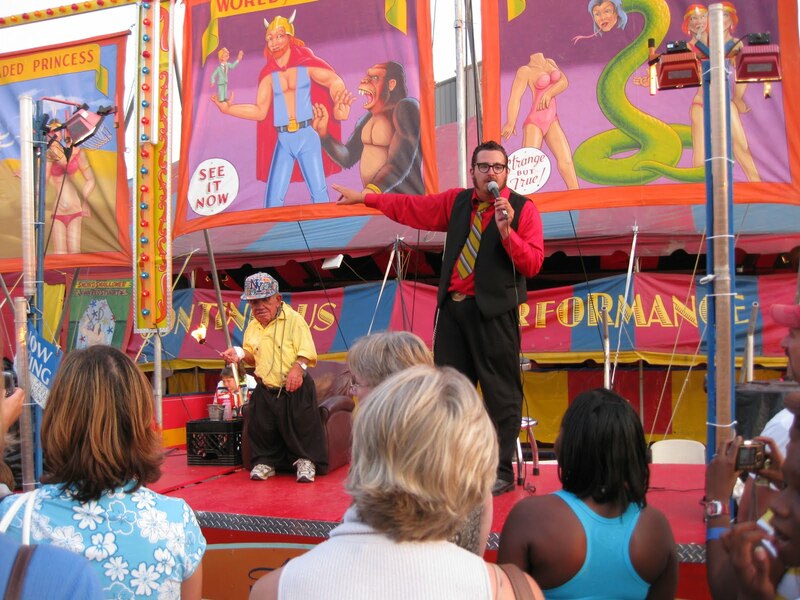 I had seen the sideshow tents on the midway of the Ohio State Fair since I was a little girl, but never ventured in. The first time I decided to pay the admission so I could be an armchair anthropologist at the so-called “freak show” – shortly after reading Dunn’s novel in the mid-1990s – I found only sword-swallowers, characters with a few corny costumes and some poor optical illusions. I was told that “political correctness” (a term that I loathe) had driven the traditional sideshow characters into obscurity. Geek love had supposedly become something only seen through a Diane Arbus camera lens to the past, even as the value of “Outsider art” was skyrocketing. So we stood there in the walkway and watched the “Pygmy King” eat some fire and then guzzle a bottle of Pepto while the caller heralded the other “wonders” inside of the tent, like hirsute and two-headed women. It was an evening special – only $2 for the show. And if I hadn’t had Declan with me, I would have gone right in. i would have went with you= and i loved that book too!